What comes to mind when you hear the word sherry? Depending on where you are from, the most likely response is little old ladies of British descent sipping on sweet wine out of small glasses. Considering the history of this particular wine this image is makes a lot of sense, but certainly isn’t 100% accurate. There is a certain irony in the fact that many of the sweet wines in the world were actually heavily targeted towards the British markets of the past, possibly none more so than sherry. They even designed specialty wines for them, most notably cream sherry which is still today the most familiar style to consumers in many parts of the world. Sherry wine as it is today is one of the oldest wine styles in the world, dating back to the Moors who introduced distillation and fortification over a thousand years ago. The British fell in love with the wine after Francis Drake sacked Cadiz and took several thousand casks back to England, and since then the UK has been their biggest market. To maintain consistency a system was devised to always have a constant supply, and this was the solera system. A minimum of four rows of barrels were stacked, and a minimum of three times a year the barrels are filled one-third from the top down. In the past this was done by hand using jugs, but today the wine is transferred to tanks and blended before being passed down. Therefore you can bottle sherry three times a year, which is important for the drier styles which are much better when they are fresh. With the higher alcohol fortification the wine can live longer in the bottle even after opening, which is why it is so common to find really old bottles in your grandparents bars. But the dry styles really need to be drunk within six months of bottling, as they tend to become a bit tired. Not easy for us down in Australia, hence my desire to taste from the solera when I visited. The two producers I visited are some of the oldest and most important in the region. Sanchez Romate goes back a few hundred years, something that very few wineries in Spain can boast considering that back then most of the fruit was going to cooperatives. The firm was one of the first and is still one of the oldest houses still under the original ownership. It was founded by Juan Sanchez de la Torre, who in an age where many of the houses being established were British was a pillar of Spanish society and provided support to the community. The flagship of the firm actually became their brandy, Cardenal Mendoza, which was created in 1887, and still represents most of their business. I was welcomed to the house that covers several blocks in Jerez de la Frontera by Fernando and Cesar, who not only introduced me to Sanchez Romate but many of the nuances of sherry itself. To welcome visitors who must arrive with an appointment, they have come up with a unique visualisation tool where they have used chalk on some of the barrels. 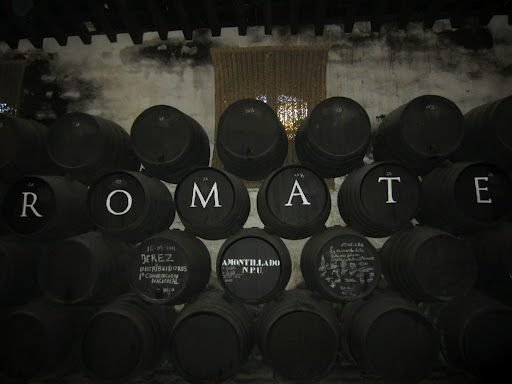 One barrel has a map of the Jerez designated area of vineyards, and notes the sherry triangle where wines much be aged and bottled in either Jerez de la Frontera, Sanlucar de Barrameda or El Puerto de Santa Maria. They also show the sherry rainbow from dry to sweet, and the classification of style from variety to bottle through the ageing process. This is so important for a unique wine like this, which to lay men is very complicated and hard to appreciate. There is something special about walking through the solera halls of a producer like Romate, with these really old American oak barrels that were painted black so it was easier to see the glisten of wine leaking through that needed to be replaced. You can smell the oxidation and flor in the air, and to protect this process they have to spray water on the floor many times a week to maintain humidity. Romate has stock of some seriously old soleras, which means that the average age of many of their wines is a lot more than your average sherry. Of course through the evapotranspiration process these wines become more concentrated and more complex with time, but also reduce in volume over time so when you get a really old example it is even more special as it is a rare amount, hence the name Very Old and Rare Sherry (VORS). 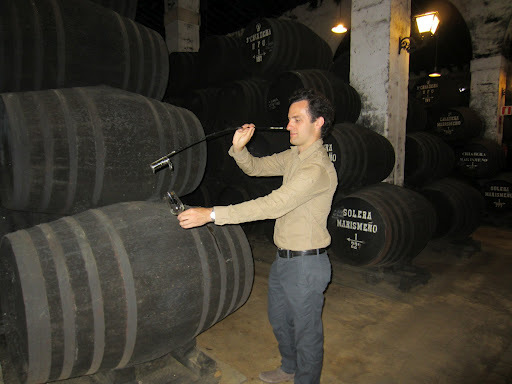 Sherry brandy goes through the same solera process as the sherry wine, although usually for a lot longer, thus maintaining the same consistency as the wine. This is quite different to more famous brandies like cognac, which are a blend of individually aged barrels before bottling. Just like the sherry wine, Sanchez Romate have some really old brandy which according to a spirit expert is almost indistinguishable from really old cognac or even whiskey. Luckily I was able to taste from the cask most of the things I have mentioned, which was like tasting history from the source. 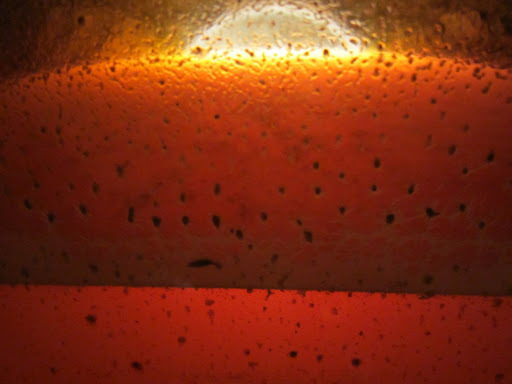 Click here to read my notes on the tasting from solera. Manzanilla is a special wine for one reason, it comes from a specific place and thus has the characteristics of the place. When I say it come from a certain place, I’m not referring to the fruit necessarily, but the ageing of the wines. The place is Sanlucar which unlike Jerez de la Frontera is on the coast, and enjoys much cooler Mediterranean breezes. This climate makes the flor on the dry wines much thicker and the wine tends to be fresher with less rancio/oxidative character, and also gives the resultant wine saltiness as well. Many people prefer manzanilla as it is the closest to normal wine, and is easy to drink chilled and fresh. 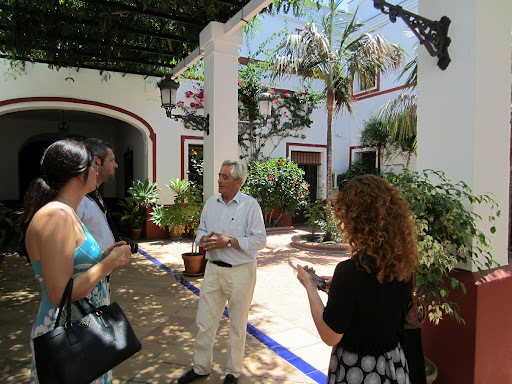 Probably the most important producer of manzanilla wine is Bodegas Hidalgo, located in the heart of Sanlucar. Like Sanchez Romate they are a family owned estate dating back several centuries that have extensive halls of very old soleras that contain the riches of the past. La Gitana is their manzanilla brand, and is the most recognisable anywhere in the world, gitana meaning gypsy in Spanish which suits the fact that it has travelled all over the world, to every continent. As another completely family owned operation for over 200 years, Hidalgo are one of the most important and also most traditional. 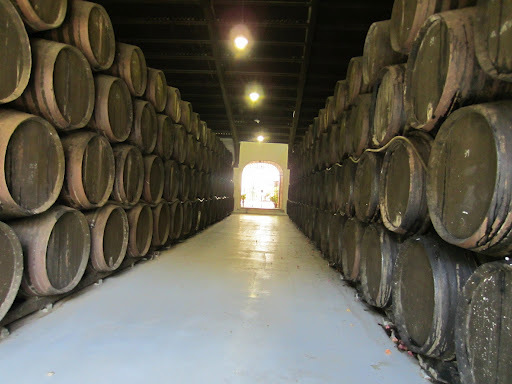 They only make wines from their own vineyards in the best parts of the Jerez area, and their cellars are so old that some of their barrels pre-date the firm’s establishment. I joined a group of trade people from the US – a couple from Portland and a sommelier from New Orleans – who were on holiday in Europe. We were taken through the house by possibly one of the most eccentric hosts I have had on my trip, who has worked there for 21 years. He had a certain flair about him, and the fact that his English was far from perfect just added to the charm and also the confusion of the visit. We were all told that this was our home and that we should relax as such, where you would never spit out wine in your own home. Of course when you are actually in your home you don’t have to go anywhere afterwards so you don’t need to worry about driving like I did. After all, sherry wines are anywhere between 15% and 20% alcohol, so a few glasses will most definitely have an effect on you. There is a special part of the cellars where they keep all of their very old examples, and our host was delighted to show us these wines first and finish with the younger and fresher wines, which confused the hell out of me. The old amontillado and oloroso wines were fascinating, particularly wine from the solera which was expertly extracted with a dramatic flick of the venencia at the end. Something I didn’t realise is that private customers can actually purchase soleras, like the Sherry Club in Tokyo which have identified a particular barrel for bottling. We all got the chance to try our hand at the venencia – I felt an enormous pressure to perform – before we parted very merrily and I joined the couple from Portland for some of the best seafood tapas on my trip, pairing perfectly with the La Gitana Manzanilla. Please click here to read my notes on the solera tasting at Hidalgo. Click here to see more photos from Day One in Jerez, Spain. On my second day I visited Gonzalez Byass and Lustau, two very different houses in the same town.